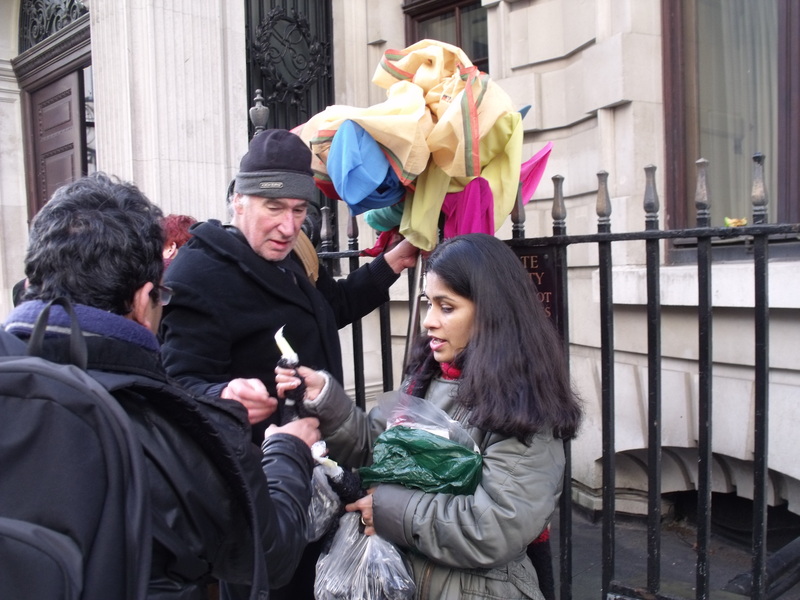 In a cold morning on a week day in December, the Bangladeshi community of London in conjunction with a diverse group of environmental and left political activists heckled the investors of Asia Energy (thereafter Global Coal Management Resources) today. 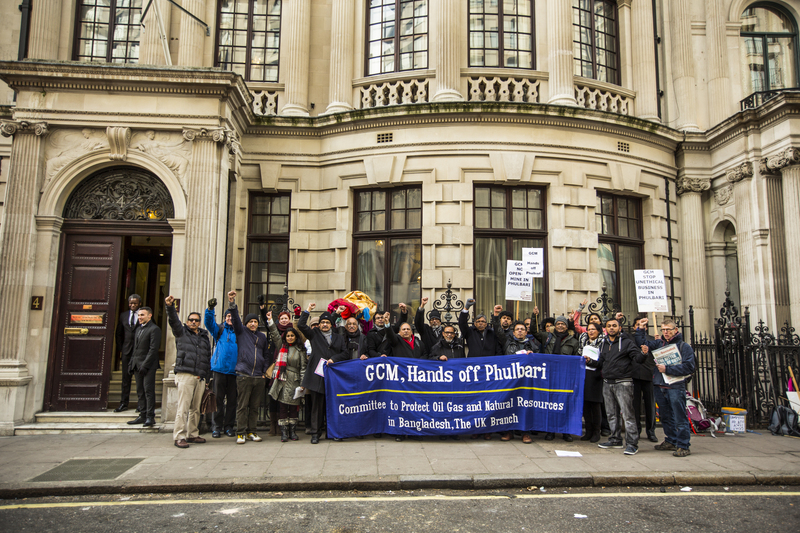 In a successful demonstration outside GCM’s Annual General Meeting at London Aeronautical Society, 4 Hamilton Place, W1, London protesters surrounded GCMs’ CEO, Gary Lye, and his fellows who are doing a fraudulent business in London’s Alternative Share Market (AIM), cheating with people of Bangladesh and UK. Protesters told that GCM has no contract with the Government of Bangladesh but they are selling illegal shares in the London AIM. 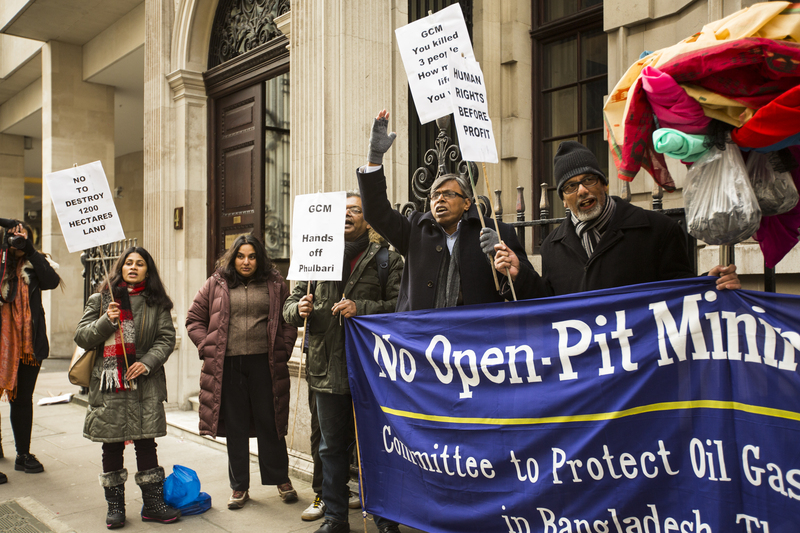 Protesters, calling in an end of GCM’s corruption and abusive activities in Bangladesh, demanded the de-listing of GCM from London AIM. They dumped coal at the entrance of the Aeronautical Society, and locked the investors into the building for two and a half hours. A group of demonstrators turned back the investors’ taxis, making the investors to walk. A delegation of protesters interrogated Gary Lye and his fellows inside the AGM. In the share holder’s meeting Gary was asked by the share holders to present the contract of the Phulbari Project which he was unable to produce. Gary does not have any appropriate answer to justify his position in relation to the impact of open pit mining in Phulbari. Protesters demanded his arrest and expulsion from Bangladesh alongside the de-listing of GCM from London’s Alternative Share Market. The manifesto of the demo reads that GCM is shamelessly lobbying with a few greedy government officials to get the contract yet they fail to recognise the fact that the people of Phulbari will not give their land, their environment and ecology to dirty coal miners. Local people will ensure that GCM is never going back to Phulbari. They will resist the destructive project of GCM, rather than so called jobs, cash and energy flow. Protestors have successfully delivered the message to GCM’s dirty coal miners that although Bangladesh is eager for energy, they will not make the same mistake as the so-called developed world in terms of climate change and environmental degradation. 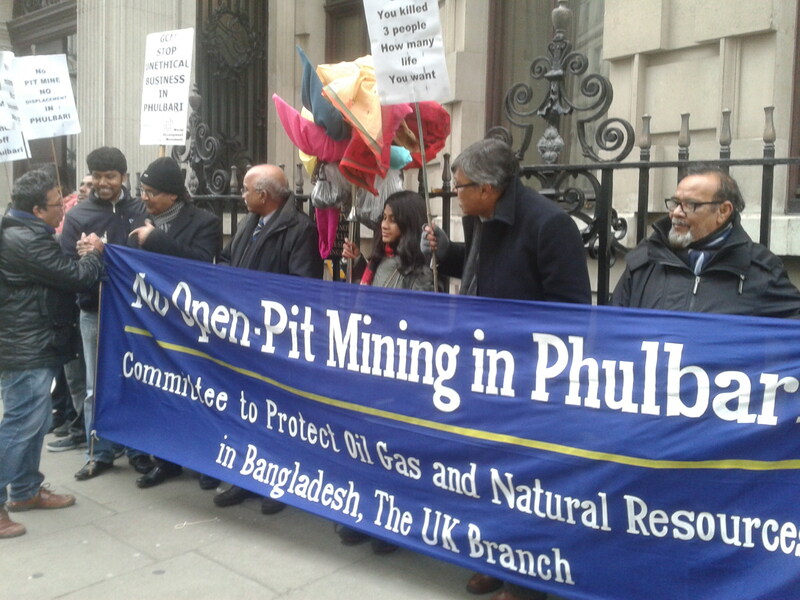 We will ensure that GCM and Gary N Lye’s dirty hands are off the Phulbari coal mine. 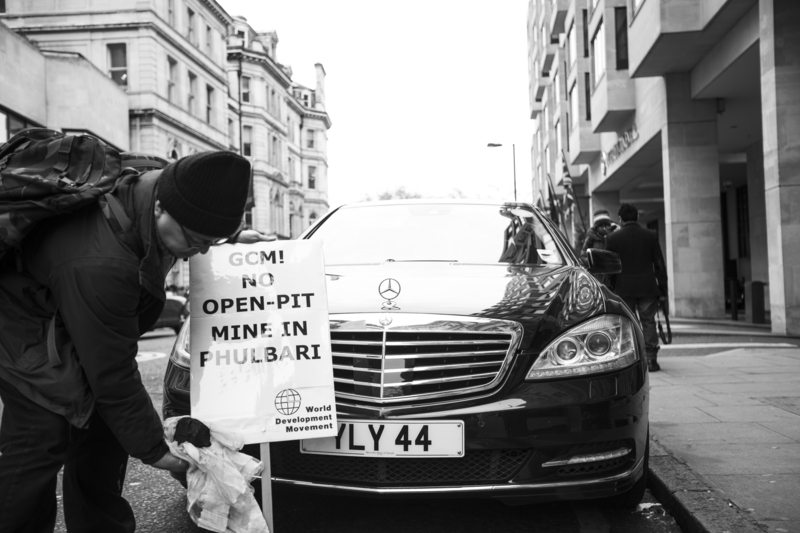 Detailed report of the action at GCM’s AGM and the demo outside the AGM will be followed soon. Meanwhile readers can view photos of our action below. This entry was posted in International Accountability Project, London Mining Network, National Committee of Bangladesh, National Contact Point UK, Phulbari, Protect Resources of Bangladesh, World Development Movement and tagged GCM AGM 2014. Bookmark the permalink.